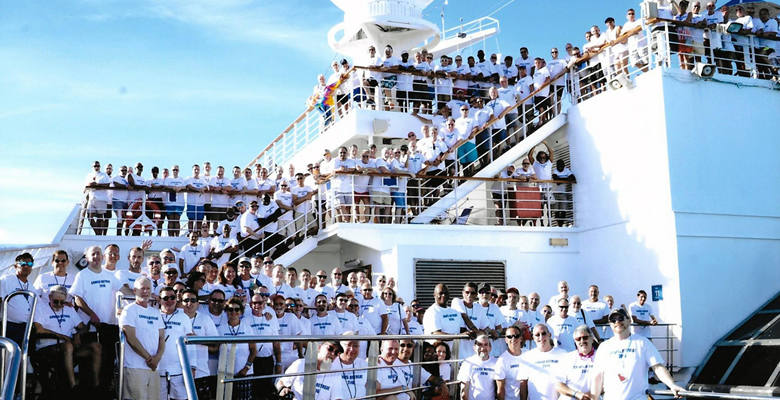 Welcome to the 15th Annual Poz Cruise Retreat! With 300+ guests expected, you will feel at home right from the first day. 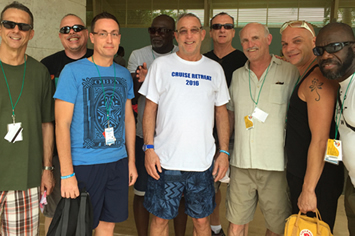 Our group of amazing men (and women) are very welcoming so it very easy to make long lasting friendship. 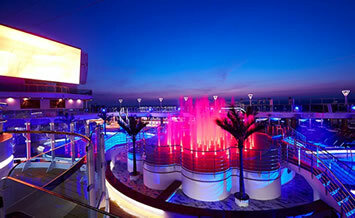 Included are private events such as cocktail parties and exclusive shore excursions plus a fun game or two. In the dining room we will have our own block of tables which is always a great way to get to know people. Feel free to table hop each night so you can meet as many people as possible. Or if you prefer enjoy the informal buffet, complimentary room service, or outstanding specialty restaurants. Our mission has always been and continues to be camaraderie and the embracing nature of the group. You will feel at ease from the very beginning. Although a predominantly gay group, we welcome everyone of all sexual persuasions. 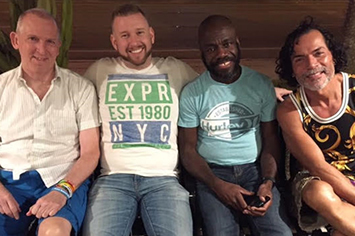 Our core group of heterosexuals, who come every year always have a blast and add tremendous energy to the entire group. We welcome your negative family and friends. People of all sexualities are encouraged to join us for our bonding and camaraderie; family, friends, partners/spouses regardless of sero-status are also welcomed. 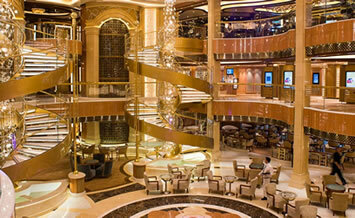 The Regal Princess is quite stunning and elegant. Princess is well known for its excellent international cuisine and outstanding service. Aside from our main dining room, enjoy seven dining options including Alfred’s Pizzeria, Trident Grill (BBQ). One of my favorites is the International Café (open 24 hours) for breakfast before excursion or late night snacks. The Regal also offers four additional specialty restaurants that have a nominal surcharge (Crown Grill, Sabatini’s, Crab Shack and Ocean Grill). Traveling solo, fear not. 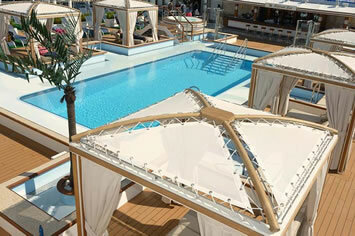 Our cruises attract a large number single travelers. We offer a roommate match program to help keep your costs down. Normally a single occupancy cabin are double the normal rates. It is most gratifying to see the large number of strong long lasting friendships that develop each year. Your new “family” awaits you . 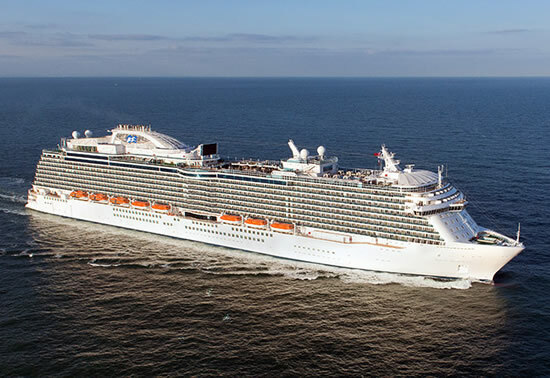 We are privileged to have many, many cruisers join us for three, five and ten years. Some never miss a year! These repeat guests give you an inkling of a new extended family waiting to meet you. Your Cruise Retreat rate includes all your meals, basic beverages and entertainment as well as our private events. Traveling solo, fear not. 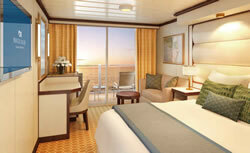 Our cruise attracts a very large number of other single travelers. In fact, if you need a roommate, we do provide a roommate match program. However, if you prefer a single occupancy cabin, there will be a single supplement. It is most gratifying to see the large number of strong long lasting friendships that develop each year. Find your new extended family. 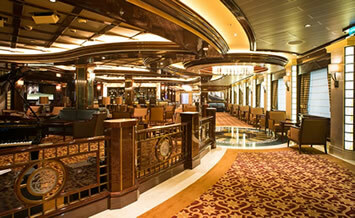 We are privileged to have many, many cruisers join us for three, five and ten years. These repeat guests give you an inkling of a new extended family waiting to meet you. 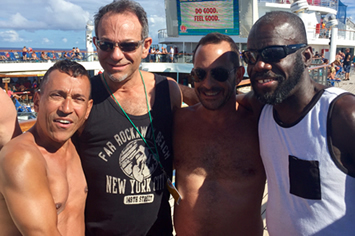 Although we can not guarantee it, dozens of people have met their partner on our cruises. The first night of every cruise we host a welcome cocktail party exclusively for our guests. This is the first time the entire group will have a chance to meet and mingle. We will make many useful announcements. Other private events are also planned for the week. 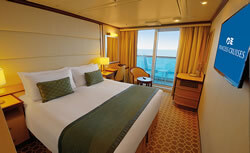 Full details of our daily itinerary will be made available to you upon check in on the ship. We have confirmed a block of tables together at 8:30 PM each evening. Since we have a block of tables, you may feel free to move from table to table each evening. We encourage this so that you get the chance to get to know as many people as possible. Two nights are designated as “formal” nights meaning jacket & tie, suit or tux. Dining the rest of the evenings is casual meaning slacks and either button down or polo type shirt. All meals in the buffet are always casual. We offer those who are traveling alone the opportunity to be paired up with other solo travelers. Roommate shares are not available in all categories. You may find your own roommate until final payment date. We assign roommate at the time of final payment. After you have been assigned a roommate we will introduce the two of you by email. The ship will offer many excursions to purchase. We however, will offer at least two or three of our own including a chartered catamaran for swimming, snorkeling and fun. 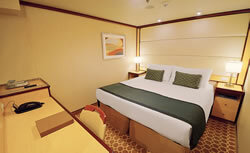 Our trips are usually lower priced and include more than what the ship will offer. 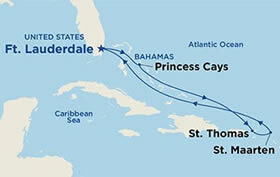 Information regarding our excursions will be sent to you about 60 days prior to sailing. 15 Nov Fun Day at Sea! 16 Nov Fun Day at Sea! Breathtaking natural beauty combined with old-world charm defines the magical allure of the Eastern Caribbean. With a distinctive fusion of European, African and Latin American influences, this region boasts quaint towns alive with diverse cultures amongst a breathtaking backdrop of swaying palm trees, velveteen sands and turquoise waters accented with rainbow fish. The locals are friendly, the duty-free shops bustling and the cultures fascinating. Soak up the sun, adopt its laid-back island mindset and explore coral reefs teeming with marine life on an Eastern Caribbean cruise vacation, roundtrip from Ft. Lauderdale for a quick weekend getaway, one week, or even longer! Princess’ exclusive port of call, Princess Cays, where you’ll enjoy a private beach party on the island of Eleuthera in the Bahamas. One hundred miles long and only two miles wide, Eleuthera offers unspoiled beaches. 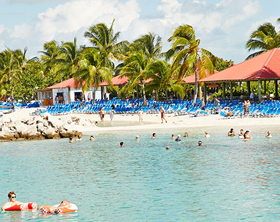 Princess Cays is situated on more than 40 acres and features over a half-mile of white-sand shoreline, all at the southern tip of the island. The resort boasts outstanding amenities while carefully preserving this natural paradise. Take in the views from the observation tower. Enjoy a complimentary beach barbecue. Sip a cool drink or browse the shops and the local craft market. All of Princess Cays’ facilities are linked by walkways. Recreational activities abound. 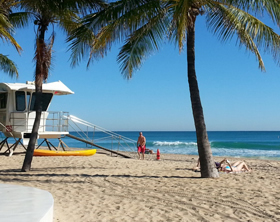 Enjoy volleyball and a full range of water sports, or simply relax on the beach. The US Virgin Islands are America’s paradise, offering an easygoing blend of island ways and American practicality. St. Thomas, capital of the island group, offers every imaginable sport: snorkeling, golfing, hiking, and sailing. Just a few miles away lay St. John and Virgin Islands National Park. Stunning mountain scenery, crystalline waters, and white-sand beaches with palms swaying in the breeze – the US Virgin Islands are truly a slice of paradise. The harbor is easily one of the Caribbean’s most scenic. 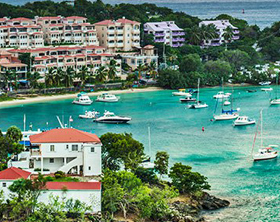 The United States purchased the Virgin Islands from Denmark for $25 million in gold. St. Thomas has a reputation as a duty free-mecca for shopping. 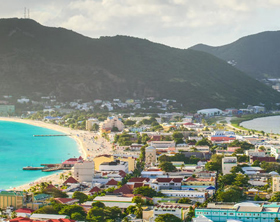 St. Maarten offers a delightful case of split personality. Legend has it that a Frenchman and a Dutchman divided ownership of the island through a walk-off: Standing back to back, the two headed in opposite directions, walking around the island until they met. Perhaps the Dutchman paused for a refreshing brew. At any rate, the French ended up claiming 21 square miles of the island to 16 square miles for the Dutch. This lively tale says much about St. Maarten’s easygoing ways. No formal boundary exists between the Dutch and French sides of the island; a simple welcome sign tells you when you cross from one country to the other. But the differences are as noticeable as the spelling of the island’s name. The French spell it St. Martin. And it’s this split personality that lends so much to the island’s charms, including an international reputation for the finest cuisine in the Caribbean. 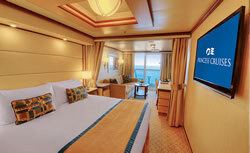 Taxes & charges of $180 pp, Pre-Paid Gratuities, and optional insurance are additional. 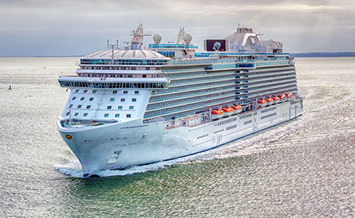 Current Promotion (ends February 28th, 2019) Included is a shipboard credit of $100 – 300 per cabin, reduced airfare reserved through Princess EZ Air, plus one specialty dining. Also included are the traditional Poz Retreat activities, subject to minimum participation. Web Page © Happy Travel, Ltd. 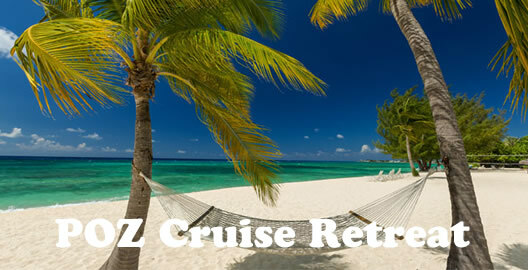 Logos and Images © Cruise Designs Travel, Atlantis Events Inc., Poz Cruise, etc.